- Terminales/Teléfonos de Empresa; en los que la empresa quierecontrolar a sus trabajadores.- Padres que quieren conocer a dondevan sus hijos (o personas mayores).- Hombres/Mujeres, que quierenespiar a su pareja, y ver a donde va.Esta aplicacion te permitiratener tu smartphone localizado en todo momento, pudiendo ver lasposiciones registradas en una pagina web.----Seguimiento GPSTepermite solicitar posiciones puntuales, hacer un seguimiento entiempo real del smartphone y ver el recorrido realizado por elsmartphone en un periodo de tiempo determinado.----AlarmasDefinelos números de teléfono móvil al que deben ser notificadas tusalertas. Puedes crear alertas de movimiento , saber cuando elsmartphone está en movimiento, etc...----InformesPermite ver elrecorrido seguido y las alertas que se han generado en undeterminado periodo de tiempo, informes personalizados con opcionde exportación.---- SeguridadEl servicio de localización deAsintecGPS, es un sistema que le proporciona seguridad las 24horas, 365 días al año de protección activa para su vehículo oactivos móviles.----Control desde tu MovilCon un terminal móvil conun navegador web y conexión a internet (Wifi o 3G) podrás estarinformado en todo momento de donde se encuentran los smartphonelocalizados.- Terminals / Phone Company, in which the company wantsto control their workers.- Parents who want to meet your children's(or older).- Men / Women, who want to spy on your partner, and seewhere it goes.This application lets you have your smartphonelocated at all times and can see the recorded positions on a webpage.----GPS TrackingIt allows you to request specific positions,track real-time smartphone and see the route the smartphone in acertain time period.----AlarmsDefines the mobile phone numbers tobe notified your alerts. You can create alerts for movement,knowing when the smartphone is in motion, etc...----InformationView the route followed and the alerts that havebeen generated in a given period of time, customized reports withexport option.---- SecurityThe AsintecGPS locator service is asystem that provides security 24 hours, 365 days a year of activeprotection for your vehicle or mobile assets.----Control yourmobileWith a mobile terminal with a web browser and an internetconnection (WiFi or 3G) you will be informed at all times of wherethe smartphone localized. 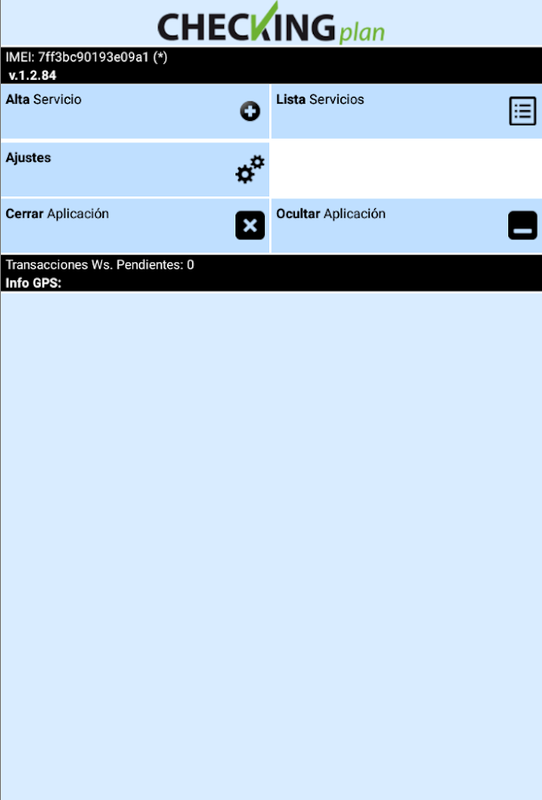 El uso de esta aplicación es de uso exclusivo para clientesregistrados en la plataforma Geombo. Para acceder a ella deben deusar los mismos datos de acceso que en la plataforma web.Si deseamás información o registrarse en nuestra plataforma póngase encontacto con nosotros a través de www.geombo.com.Visualiza ygestiona tu flota desde tu dispositivo móvil. Con esta aplicaciónpodrás estar informado en todo momento de donde están tus vehículoso terminales.Dispone una interfaz sencilla e intuitiva para conocerde un vistazo los movimientos de tu flota, rutas e incluso laubicación exacta. Podrás estar informado no sólo de las últimasposiciones, sino también crear alarmas, dar de alta consumos ygestionar la localización.Es la aplicación se complementa con laplataforma de Localización Geombo. Funcionalidades - Control desdetú móvil: Dispón de tus datos estés donde estés. Visualiza a tuflota desde tu Smartphone o dispositivo de movilidad. - Gestión deFlotas: Podrás estar informado de las últimas posiciones, crearalarmas, dar de alta consumos etc…- Diferente gestión: Dispone deun modo emisor y modo receptor para mejorar la gestión de tuflota.The use of this application is exclusively for clientsregistered in the Geombo platform. To access it must use the samedata access on the web platform.For more information or to registeron our platform please contact us through www.geombo.com.View andmanage your fleet from your mobile device. With this applicationyou can be informed at all times of where your vehicles orterminals.It has a simple and intuitive interface to know at aglance the movements of your fleet, routes and even the exactlocation. You can be informed not only of the last positions, butalso to create alarms, give high consumption and manage thelocation.It is complemented by the application platform LocationGeombo.features- Control from Mobile you: Arrange your datawherever you are. Visualize your fleet from your smartphone ormobile device.- Fleet Management: You can be informed of the latestpositions, creating alarms, give high consumption etc ...-Different management: It has a transmitter mode and receiver modeto improve the management of your fleet. Tasks is a beautifully simple, free todo list, task list andreminder app that will help keep your busy life organised everyday.No matter who you are or what you do Tasks can help! Get started inno time, quickly and easily add new tasks as you think of themusing quick add, via a shortcut (Android 7.1 and higher) or evencreate from another app by sharing with Tasks. Note for ReviewersIf there is a feature you would like or you require an issue to beresolved please email me and I will gladly help. A beautifullysimple todo list app Tasks is a simple todo list app thatemphasises simplicity and ease of use. Whether you want a shoppinglist, grocery list or you just have lots of things to rememberTasks is built for you. With Tasks you can build powerful lists,colour code them and then manage them with intuitive gestures likedrag and drop to re-prioritise or swiping to delete. Use remindersso that to-dos can be delivered at the right time and withactionable notifications there is no need to open the app, simplymark a task as done or snooze for later. Have your say Tasks isdesigned to be beautifully simple to use. This app is in activedevelopment with the most popular feature requests / suggestionsadded. So if you want to shape the future of Tasks just give usyour feedback. One-stop task manager. Monitor and kill task, speed up phone, andsave battery. Features: * 1*1 widget to monitor memory usage, fastkill task or launch application when click. * Kill task to freememory. * Sort task by name. * Auto-kill task when screen turnsoff. * Context menu to switch, uninstall, ignore, auto-kill orsearch application. * Ignore preferred application when kill. *Bulk select and rich notification. * Directly force stop task forrooted device. If you would like to translate this application toyour native language, please contact [email protected], thanks. The Most Classic Task Killer or Task Manager, Speed Booster,Battery Saver. Advanced Task Killer helps over 70 millions Phone.You can use it to kill applications and boost memory. It doesn'tspeed up or save battery directly. However if you kill any appsconsuming battery or CPU, you might feel it speed up your phone andsaved your battery. *Services and front apps cannot be killeddirectly, you have to ignore or 'force stop' them*Features:-IgnoreList-One tap widget-Auto kill-Customize item heightATK is oftenused to kill app and clean memory. We do suggest people use ATKmanually kill apps instead of auto killing app.1. How to use it(for new users to quick start)?ATK is pretty simple. Open this tooland take a look at the running applications list? Uncheck some appsyou don't want to kill (such as Advanced Task Killer and somesystem apps) Tap the button 'Kill selected apps', it will kill allapplications checked. 2. How to use it (for new users to domore)?If you don't want to kill any app, you can tap it on therunning applications list. Then it's checking box will turn togray. 3. Why there are app running that I haven't used or evenopened?Some app will start up once you turn on your phone or beinvoked by some events. 4. What is ignore list/ignore?Ignore listis for you to ignore some app you don't want to kill. If you longpress on the app listed on the main screen of ATK, the menu willpop up, then you can select 'Ignore', the application would bemoved to ignore list. When you tap 'Kill selected apps', it won'tbe killed any more. 5. What is default action for long press?Youcan set your default action for long press and click on thesettings. The system default action for long press is pop-menu.That means you when you long press on the application (displays onthe running applications list), a pop-menu would shows up. Forexample, if you want to switch to the application after you longpress on it, you can set the default action of long press to'Switch to'. 6. Why I lost my network connection after I tap 'killselected apps'? This is because some apps related with networkconnection are killed, such as 'voicemail'. You can ignore itinstead of killing it. 7. Why my Home reloaded?This is because someapps related with Home are killed. Such as 'HTC Sense', 'Mail'(ifit is integrated with Home). You can ignore it instead of killingit. 8. Why I cannot receive notification of Email?This is becauseyou killed 'Email'. Instead of killing it, you need to ignore it.9. What is Auto Kill?If you want to kill apps automatically youneed to choose one of auto-kill level- Safe: Only kill the appsaren't running but still consume memory.- Aggressive: Kill the appsrunning background and apps aren't running.- Crazy: All apps exceptfor apps you are using with.You should be able to see Auto Killinformation shows on the title, like 'Auto-Kill: 12:20'. That meansauto kill will start at 12:20, you can also change the frequency toimpact the auto kill start time. App killer is only a tool to killapps and task. It won't help your battery directly. But if you killany app which consumes battery a lot, you might think app killer ishelping your battery.Advanced Task Killer Pro is paid version whichdoesn't contain ads.Note: For android 2.2 and later version, taskmanager cannot kill services and front apps, you have to force stopthem. If you use task manager to kill them, services might restart;also notification won't be erased from the top bar. So we don'tsuggest people use task manager kill them.